If “brow icon” brings to mind a certain Delevingne, you probably haven’t seen Yasmine Sima yet. The doe-eyed, Ford Models–signed ingénue possesses a set of brows that can only be described as otherworldly. Full, thick, and unabashedly prominent, Sima’s face-framing arches are the stuff dreams (and extreme envy) are made of. With her raven-colored hair and Persian American background, Sima represents a new generation of models who don’t fit fashion’s formerly uniform beauty ideals—to which we say it’s about time. Naturally, we had lots of questions (mostly of the lash and brow variety)—keep scrolling to find out her answers! BYRDIE: Your brows are outstanding. Have you always loved having fuller brows? YASMINE SIMA: I’ve always had a hate-love relationship with my eyebrows. I definitely love their fullness now, but I didn’t feel the same way about them in my earlier teen years—especially because I had a unibrow, and not everyone was so nice to me about it! My perception of it has definitely changed. Now I love how people notice my heritage when they first glance them. I love that I am Middle Eastern, so that makes me happy. BYRDIE: Tell us about your daily brow routine. YS: Being Persian has its perks—like the full, thick brows and lashes. But maintaining them is really difficult because they grow out so fast! I usually trim my brows once every three weeks if I feel like they’ve grown long. As for shaping, I only pluck the middle every five days to prevent the unibrow situation. I don’t pluck more than that, because I think keeping them in their natural shape is better! It makes them look fuller that way too. I don’t use any products for my brows. I usually just brush them out every morning with Lancôme’s Eyebrow Reshaper Brush ($28) so they don't look too messy. 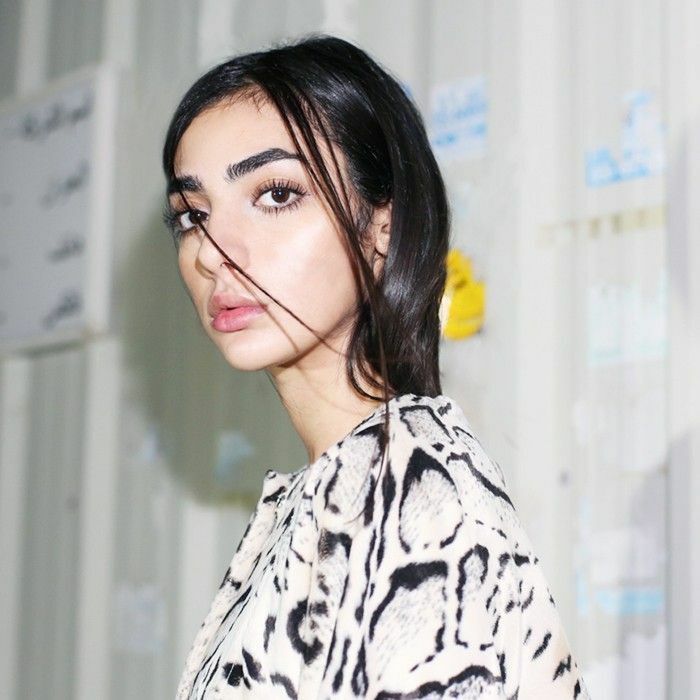 BYRDIE: Are there any traditional Persian beauty tips you swear by? YS: Rose water is life. I apply it with a cotton ball after I wash my face every morning. BYRDIE: Your lashes are another defining feature. What’s your favorite mascara? YS: I swear by Lancôme Hypnôse Mascara ($28). It makes my lashes look longer than any other brand. I curl my lashes first, then apply a coat or two of it. BYRDIE: Any other lash secrets? YS: I think the most important thing in maintaining long and healthy lashes is removing your eye makeup every night. I usually apply organic coconut oil on them every now and then to revive them. As for making them appear longer, curling them makes the biggest difference! And if I want to go without mascara for the day, I put Vaseline on them; it maximizes the length and the thickness. This works for the brows, too. BYRDIE: Fashion is often criticized for not being diverse. As a Persian American, what do you hope to teach the younger generation about beauty? YS: I think the fashion industry is definitely growing to embrace more diverse looks, which has worked in my advantage. I really encourage all diverse girls to embrace their beauty more, whether they want to be models or actresses or not. Not all beauties have to be tall and blond with blue eyes! Hopefully the fashion industry continues growing in the right direction so all diverse girls from different ethnicities really start to appreciate their uniqueness and beauty. What do you think about Sima’s beauty philosophy and routine? Want more? Find out the exact no-makeup makeup routine of another up-and-coming model.